Preparing for Kindergarten with The Holly Springs School Pre-Kindergarten Program! Our Pre-K classroom is home to our four and five- year-olds, and centers itself around preparing for Kindergarten. The owner created this unique program more than a decade ago when this school first opened. She used her classroom experiences to create a similar but distinct learning environment. This allowed the children a real-life experience for the structure and better prepared them for what they would encounter in the coming Kindergarten year. To accomplish this real-life experience, only teachers who had Pre-K teaching experience and with a direct interest in the Pre-K field were hired. Each of our teachers receives continuing education in subject content areas to ensure that they are in step with the National Common Core Standards. In the classroom, the teachers incorporate more field trips and learning activities in their weekly lesson planning. They utilize interest activities that include visits to the science museum, special math visitors, area artists and other venues and attractions to realize the full impact of the goals and objectives for the class. The aim of the program and curriculum is to allow children to build greater confidence for the coming year. It is also designed to get them comfortable with the pace they will experience in Kindergarten. The developmental Pre-K curriculum recognizes that your child will soon be entering schools that have clear expectations of child readiness. We have found that this preparation with like experiences to be the most effective. Many parents have returned to us and shared about the successes their children have experienced because of the careful preparation and care they received while with us. 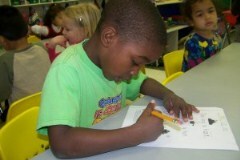 Similar to our three and four-year-old classroom, our Pre-K classroom is organized in learning centers. These centers are supplemented by a number of independent learning stations, designed for use by one or two children. The Houghton-Mifflin® curriculum we utilize takes a comprehensive approach that challenges children and supports all areas of development in the core subjects including math, science, language, art and the world around them. 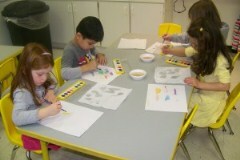 We always enjoy creating art at Holly Springs School for Early Education! We have a very strong arts component at this level. The art curriculum acts as an outlet for personal expression. Children are exposed to the works of such artists as Picasso, Van Gogh, and Monet. They also are exposed to working with various art mediums like clay, metal, papier-mâché, and oil paints. Parents view the many months of work at the classroom’s Annual Arts Show. Additionally, parents are invited to the many performances held throughout the year. The anticipation of this event creates much excitement throughout the entire school as well as with parents waiting to view their child’s works of art. This event has caused recognition in the Holly Springs Sun for fostering the importance of art education in young children. This is one of many events scheduled throughout the school year. BE AN ADVOCATE FOR YOUR CHILD’S SUCESSS…BEGIN THAT JOURNEY WITH US!